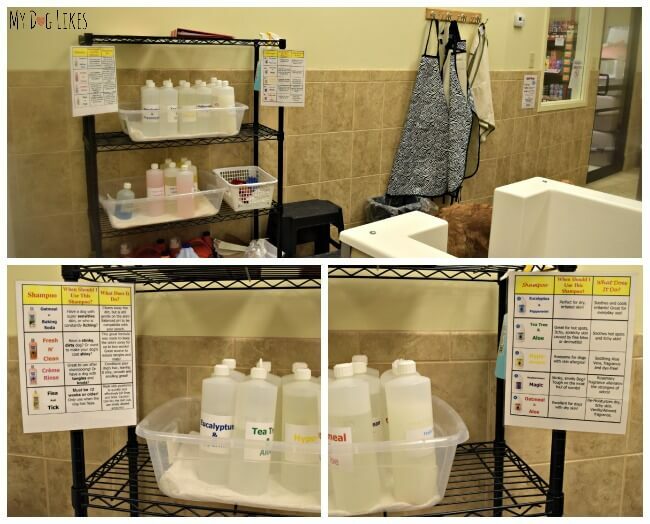 Our Pet Self-Wash stations are at each location and designed to take the fuss out of giving your pet a bath! Our beautiful walk up tubs allow you to get your pup into the tub without lifting. 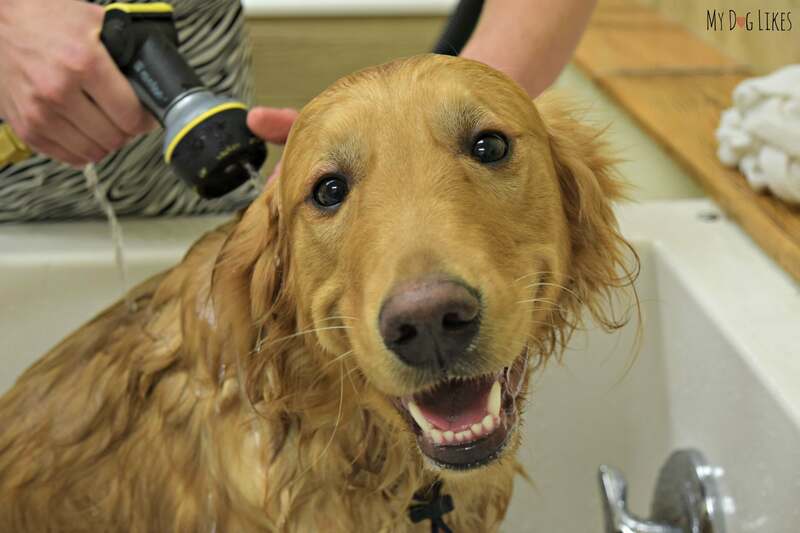 We provide shampoo, conditioner, towels, aprons, grooming tools, and anything else you might need to help get your pooch clean. A TRIP TO THE SELF WASH! Working at the Car Self-Wash yeah! After a short drive, we arrived at our favorite pet store, PetSaver Superstore, which just so happens to have great (and newly remodeled) self-wash stations. 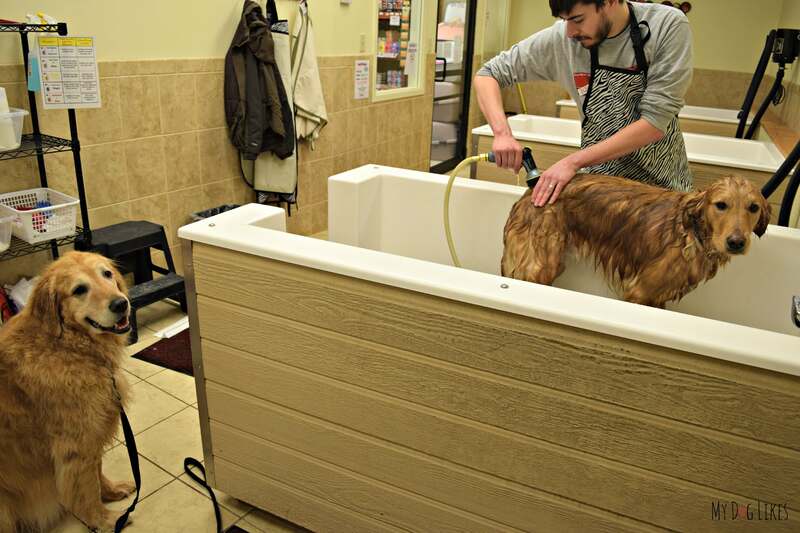 These self-wash stations have been designed to take the fuss out of giving your pet a bath. Their motto: “You provide the dog, we provide the clean-up” says it all. The room is brightly lit and contains 4 walk-in tubs (no lifting-big dog owners rejoice). The friendly staff is eager to show you around and walk you through the whole process. 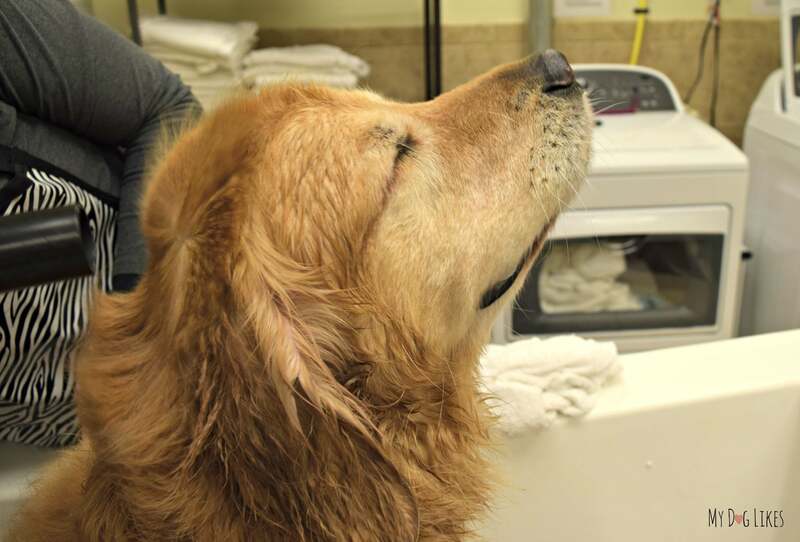 They give you plenty of time to complete the bathing processing and show you all of the bathing supplies and grooming products that are at your disposal during a wash! 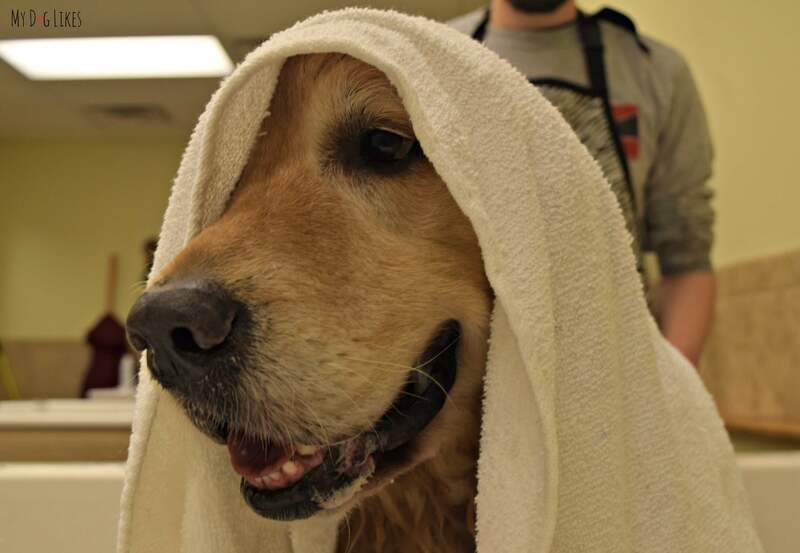 For the price of $9.99 you get it all: Shampoo, Conditioner, Towels, APRONS (Hallelujah), Grooming Tools, and anything else you might need to help get your pooch clean. Even better, if you are part of their responsible dog owner club, you earn points toward store rewards (Cha-Ching!). It was all hands on deck, for these two Pups! 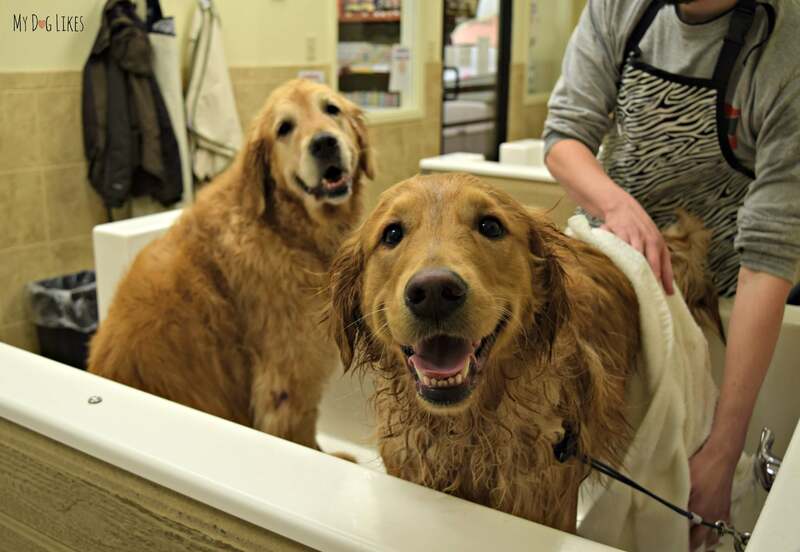 We love that the self-wash unit is in the back of the store, in its own separate room (fewer doggy distractions). 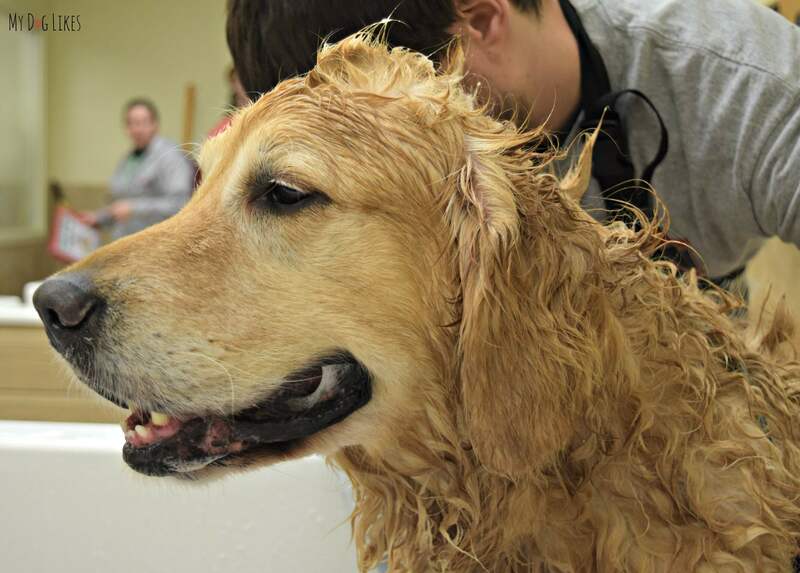 We needed all hands on deck for these pups and it was nice to let one sit outside the tub (with his leash on), while we worked on the other together – After all teamwork makes the dream work! Climbing into the tub was easy, even for our sweet senior, Harley. The stairs and tub are covered in a no slip mat, taking away the fear that our sometimes cautious canine has on slippery surfaces. We love that the tub is an easy walk in style with no door, the boys climbed right in. Each tub is equipped with a gentle sprayer hose and an adjustable tethered leash, to make sure your best friend stays safe (and in place). After securing the pups, it was time to get wet! 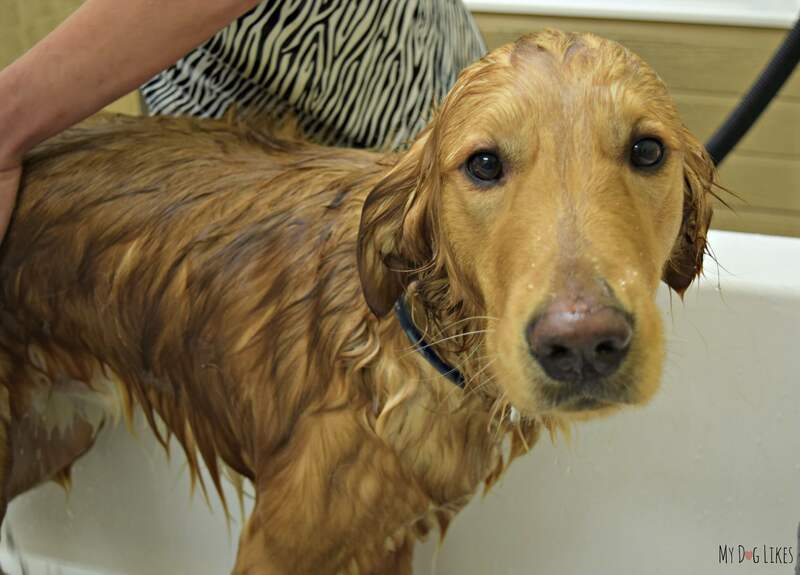 Because of the ingredients, Natural shampoos are not nearly as “sudsy” as what you might be used to, but it easily spread through those golden locks, creating just the right amount of suds to know that you had thoroughly covered an area.We took care to make sure that no soap or water got in their eyes and ears! Though the shampoo & conditioner formulas are gentle, organic, and natural, there is no sacrifice in their cleaning power and both easily tackled the daunting golden task before them: washing all evidence of messy transgressions right down the drain. With the pups nice and clean, it was time to be dried. PetSaver provided us with all the towels we needed to start the process. After the towel, it was time for a blow dry! The blow dryers are gentle and not so noisy that it scared the boys….In fact I would say they enjoyed it quite a bit! As we worked through those golden locks, we were able to use some of the handy grooming tools to remove and knots or mats that eluded us before. Having everything right there really made it easy! So Happy,Fresh and So Clean!! Well the end result was pretty kissable – We had two fluffy, soft, super yummy smelling puppies, ready for extra smooches and cuddles (I just wanted to stick my face in their furry bodies – and yeah, I pretty much did!!). 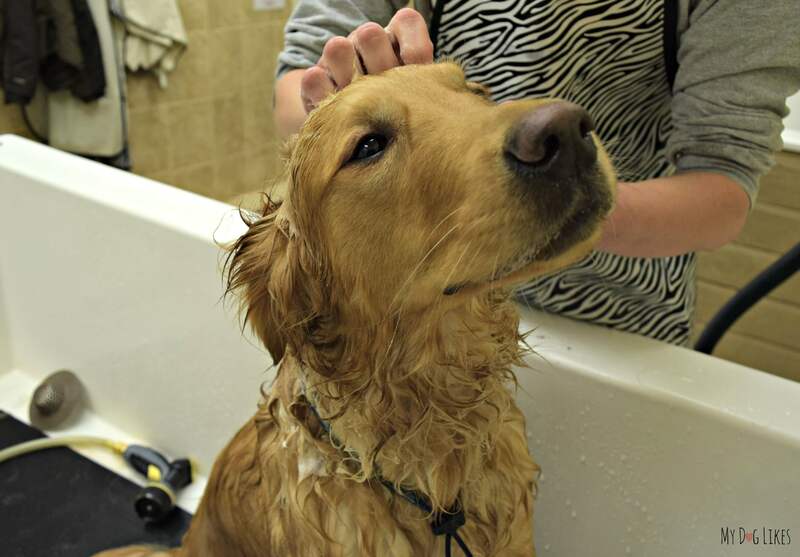 We love taking the boys to the self-wash. For adventurous pups who like to explore and get dirty, its a great option when you don’t want the great outdoors, brought indoors! Not only does the pricing include all of the supplies you need, but you earn points toward free store rewards! The facility is clean, well-kept, and flexible! Best of all, no worries about clogging your pipes with all the loose fur!